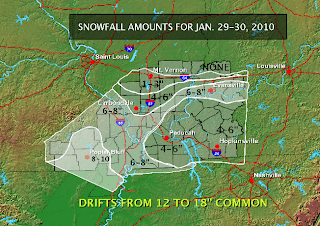 The National Weather Service in Paducah, Kentucky has put together a map showing snow totals in their coverage area. It is always interesting to see how these things pan out. 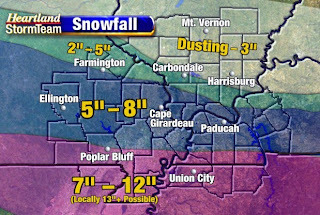 Here was our forecast from Thursday afternoon. im suppose to be traveling down to the new madrid area this friday afternoon . are we expecting anymore bad snow storms like the last one we had ? or should traveling be pretty much ohkay .? Please have the weather warnings updated on the weather page, it still calls for a "Winter weather warning Thursday thru Saturday Morning". I believe this was for last week.